FTC Disclosure: Book received at no charge to facilitate unbiased review. Get out your looking glass and swing on by. A bright, colorful jungle awaits. While searching for the cute monkey, your bound to learn some fun facts along the way about other jungle animals. Did you know that little birds fly into the mouths of crocodile to pick meat off their teeth? 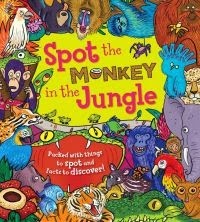 The jungle is full of other things to find and other interesting facts. Watch the reader interact Spot the Monkey in the Jungle with curiosity and joy all while increasing vocabulary and teaching differentiation through adjectives. A fun book that will help stimulate conversation while reading together.